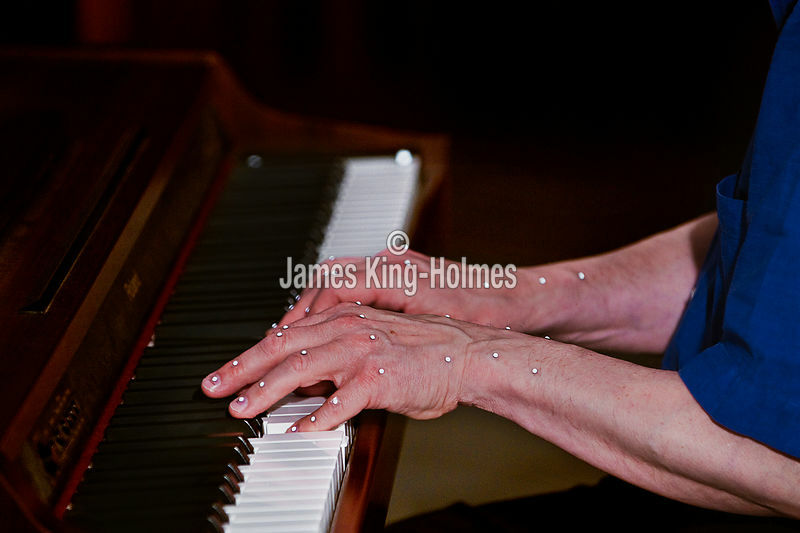 The hands of Prof David Owen Norris, noted pianist and Professor of Music at the University of Southampton as he plays a piano whilst high-technology Vicon motion-capture cameras plot a 3-dimensional image of the small retroflective markers taped to points on his fingers and wrists. Markers are also plced on his feet, to measure pedal movements. This technique is known as HAWK (Hand And Wrist Kinetics). The information from the cameras is used to construct a plot of the finger and hand movements and the research could have implications for the understanding of repetitive strain injury and also for the teaching and understanding of musical performance.